The latest member of the 'Girls with Acoustic Guitars Club', Terra Naomi, is releasing her second single, 'Not Sorry' on the 10th September. 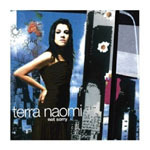 Having played Live Earth and been named as one of the "Top 12 DIY Artists of 2002" by Performing Songwriters Magazine Terra has been a very busy lady. Terra Naomi's most distinguishing feature is without a doubt her spectacular voice, from the first word you are captivated by the lyrics and after 52 seconds we are treated to the first chorus, a soaring, powerful and quite emotionally delivered one which provides a perfect counter-point to the slightly slower verses. With an already impressive fan base I'm sure we can expect Terra Naomi to see great success in the coming months. 'Not Sorry' Was BBC Radio 2's single of the week back in August and it was well deserved, the single is out on Monday and is well worth getting a hold of.